Patched is based on Dr Jarrod Gilbert’s PhD studies in sociology conducted at the University of Canterbury, for which he also received a C. Wright Mills Award from the US-based Society for the Study of Social Problems. It represents a decade of research into the development of New Zealand gangs and their impact on society, but is emphatically not a dry or overly academic account. Gilbert spent eight years in the field, ‘hanging around’, as he puts it, with gangs and living their life, gaining access to information not known outside of these closed and usually secretive groups; it is the insight afforded by the real experience of the insider, rather than the vicarious one of the academic observer, that gives the book its authority and impact. The story is an important, if chilling, one for New Zealanders, and it is told with humour and pathos as well as uncompromising honesty. The detailed descriptions of extreme violent acts are challenging enough, but the equally disturbing justifications by those involved are even more confronting. I found it difficult to read about the minimisation and blaming of the victims of gang sexual violence in the 1970’s and 1980’s in particular, since such attitudes are still present among many current gang members I have clinically assessed or treated. The early chapters on the development of gangs from the 1950’s to the1970’s recount a rollicking ride through our social history from the personal experience of gang members, rather than lurid media exposés or the brief, mundane reports of the daily court news. The later chapters provide coverage of how gangs transformed into more sophisticated criminal enterprises in a dynamic interaction with the government’s legal and justice responses. This sociological analysis also details the move to lifelong gang engagement and intergenerational membership and explains why gangs are likely to remain a part of our society. As an older New Zealander I was able to recall this often violent history and the attitude of society (and indeed the police and politicians) to the perceived burgeoning gang problem. However, I suspect that for many, this turbulent history will come as a surprise. Thus this book is likely to be of particular interest to those with little personal or professional knowledge of what Dr Gilbert colourfully terms “our gang nation”. 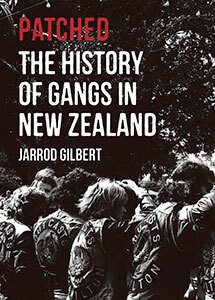 While there have been other books examining New Zealand gangs, looking at structures and to some extent history, this, in my opinion, is the most comprehensive account of their development thus far. Dr Gilbert’s high level of access in his ethnographic research provides the personal detail that makes this book a readable and authoritative source of information for a wide audience. It is fitting, therefore, that Patched was selected as the winner of the People Choice Award of the New Zealand Post Book Awards 2013. Dr Nick Wilson is a clinical psychologist and researcher who has worked in the criminal psychology field in New Zealand for the last 18 years. His professional practice has involved him in assessing and treating high risk violent offenders, unsurprisingly to the readers of this book, many were gang members!